Prominent in the foreground is the Georgian Greyhound Hotel in Cromford's Market Place, built in 1778; when this picture was taken over 100 years later Matthew Hill was running the hotel. Behind the Inn is the Greyhound Pond, at times also known as the Mill Pond or Cromford Pond. It was constructed by Sir Richard Arkwright about 1785 when he dammed the Cromford Sough to supply his mills with water. The road to the left of the pond is Water Lane, Cromford. To the right of the pond is the hamlet of Scarthin which was for many years part of Matlock Bath. The ancient parish boundary went along the edge of the pond. In 1892 Scarthin consisted of the row on the waterfront and the three or four rows of houses further back and was densely populated. In 1890 there were 121 houses in Scarthin, with a population of 600; this was approximately one third of the total for the parish of Matlock Bath but in a much smaller area than the rest of the village. The newspapers of the 1890s contain numerous articles about sewage but Matlock Bath Local Board, later the Urban District Council were reluctant to commit to the expense when the Councils with larger populations upstream (i.e. Matlock, amongst others) did nothing about their own problems. In 1897 Matlock Bath UDC's General Purposes Committee recommended that "Mr Arkwright's agent's attention be called to the fact that night soil was being removed from Scarthin in the day time, and asking the same to removed at night in a properly constructed cart". On a pleasanter note the Scarthin Mission Church, at the end of Scarthin furthest away from the camera, was said to be self-supporting in 1892. It closed for a short while for redecoration and refurbishment but was re-opened in late 1893. The very first gathering of the Scarthin Men's Society took place in the Temperance Room on 28 Dec 1897. The programme was a mixture of music, recitations and readings. The musical part of the programme consisted of a piano duet, cornet solos and various songs. Curiously, despite it being a men's group there were women present who joined in with the performances. Matlock Bath & Scarthin Newspaper Cuttings has two articles about poor conditions at Scarthin twenty years before this picture was taken. See 1871 and 1872. 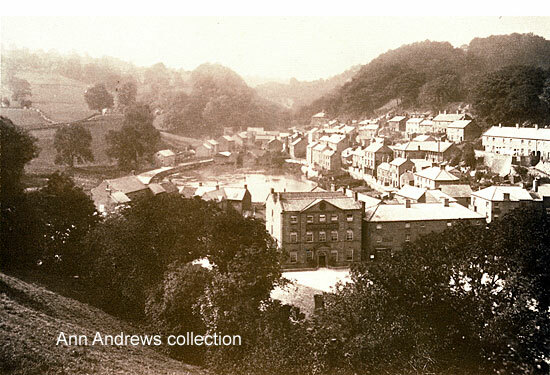 Matlock: The Derwent, about 1910, & the Sewerage Scheme. Note how long it took Matlock to resolve the sewage issue. Page written, researched by and © Ann Andrews. Glover, Stephen (1833) "The History and Gazetteer of the County of Derby ..." Edited by T. Noble. pub. Derby and London . Glover described the inn as large and handsome. "The Derwent Valley Mills and their Communities" (2001), The Derwent Valley Mills Partnership, County Hall, Matlock, Derbyshire, DE4 3AG. ISBN 0-9541940-0-4. Also see the Arkwright section of "The Beauties of England & Wales", 1802. Ordnance Survey Map (1903), pub H.M.S.O. Both he 1891 census and the 1901 census returns for Scarthin Nick are elsewhere on this website. "Derbyshire Times", 19 November 1890. "Derbyshire Times", 15 May 1897. Matlock Bath Urban District Council Meeting. General Purposes Committee Report. "Derbyshire Times", 2 January 1892. Report from Mr. Cubley at Holy Trinity Church's annual gathering. "Derby Daily Telegraph" 15 December 1893. Re-opening of Scarthin Mission Church. "The prettily situated Scarthin Mission Church, which represents the Church England the Scarthin district, has been closed recently for re-decoration. re-opening The seating had been renovated ... "
 "Derbyshire Times", 1 January 1898 (Sat).